The latest update to codeBeamer ALM, version 9.3 is released today (11 Feb 2019). Continue reading for more details about this new version, or sign up to join our release announcement webinar on 20 Feb! codeBeamer ALM 9.3 brings a host of new features and improvements to make the lives of software product developers easier. 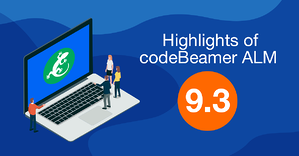 From new native integrations through smarter approval & Agile release management to updated dynamic Word reporting templates, codeBeamer ALM 9.3 is packed with updates to help you accelerate innovation. Let’s get down to the details! codeBeamer’s Review Hub functionality received some updates in version 9.3. You can now easily embed approval actions (using guard conditions) in your workflow, with the option to set a certain number of mandatory e-signatures to pass approval. For internal and external auditors, the new Review History feature guarantees a complete overview of your approval processes. Combine this with Show Review Results plugin and widget to enhance approval transparency and visibility at audits. codeBeamer ALM 9.3 improves the usability and performance of our platform’s Agile capabilities. With the updated release planner, you can now use multi-select to easily move and manage multiple work items at once. In addition, you can now use a workflow action to automatically clean up your sprints and releases based on your preconfigured settings. For instance, any items that are still in progress at the end of your sprint can be automatically moved to the next sprint. Items not even started can just be put back in the backlog. By automating manual tasks based on easy and flexible configuration options, this feature saves your team time and effort in managing Agile releases. In addition to codeBeamer’s already robust data analytics and reporting features, 9.3 brings important new functionality. A new burn-up chart and widget enhance accuracy by letting you omit weekends and (predefined) holidays when calculating your charts. This way, you can be sure that your stats accurately reflect team performance. You can now easily reuse those highly accurate reports, too! Just configure your own report templates and reuse them, accessing always up-to-date stats to cut reporting times. Need to export those reports? No problem. codeBeamer ALM 9.3’s new MS Word export feature uses Mail Merge Word placeholders to make it easier for you to build custom report templates. For advanced users, codeBeamer's new version brings updates to our tracker system, primarily related to dependency management. In codeBeamer ALM 9.3, bidirectional suspected change references, and recursive tracker field dependency checks are available. So what does all that mean? Bidirectional suspected change references notify you of changes in both upstream and downstream references to your chosen item. This way, you’ll never miss any changes in related items that could affect the work you’re doing. Recursive tracker field dependency checks, on the other hand, go a step further. With this feature, you will be notified about those associated items to a chosen artifact that are still open to changes. Not only will you be notified of the actual changes already made to those items, but also the possibility of them changing. If they’re not yet locked down and could potentially change, you'll get a notification. This feature is greatly helpful if you’re looking to gain clarity when finalizing large numbers of requirements or other items. In addition, significant improvements were made to the Dependent reference field's handling and usability. As the go-to tool for mission-critical app developers, codeBeamer's latest version 9.3 brings improvements targeted at high availability. To ensure the effective functioning of the production environment even if an application server fails, this release brings optimized Docker images deployed by OpenShift. Starting with release 9.3, codeBeamer supports Single Sign-On via MITREid Connect. This certified OpenID Connect reference implementation, developed by the MIT Internet Trust Consortium, is based on Java on the Spring platform and helps ensure security. OpenID Connect is a simple identity layer on top of the OAuth2 protocol which allows codeBeamer to verify the identity of the end user based on the authentication performed by an Authorization Server, as well as to obtain basic profile information about the end user. You can now access this latest version of codeBeamer ALM as production-ready Docker images. Look for us in the Docker repository! This version of codeBeamer ALM also makes the popular Swagger API available, making it even easier to integrate the platform into your toolchain. codeBeamer ALM 9.3 also received some behind the scene updates! This version enhances security with some fixed vulnerabilities, hack prevention on SysAdmin pages, and updated Tomcat server SSL configurations. From now on, only TLS 1.1 and TLS 1.2 standards are supported. To help you better monitor system performance, we have greatly improved our Server Status Dashboard. System admins can now simply export and download data from the dashboard which logs and displays all sorts of activities including restarts, GC memory and CPU usage, current and maximum system memory, a history of executed commands and LDAP logins. In addition to existing out-of-the-box integrations, this new version connects codeBeamer ALM to further 3rd party tools: BitBucket and IBM RPE. codeBeamer 9.3’s integration with the IBM Rational Publishing Engine supports the generation of doc/PDF files, while the new BitBucket integration provides access to an external and self-hosted source control management system. User preferences features have been added, including the "Open link in new tab"
To learn more about how codeBeamer ALM's new version 9.3 could help your team, sign up for our release announcement webinar on 20 Feb below!